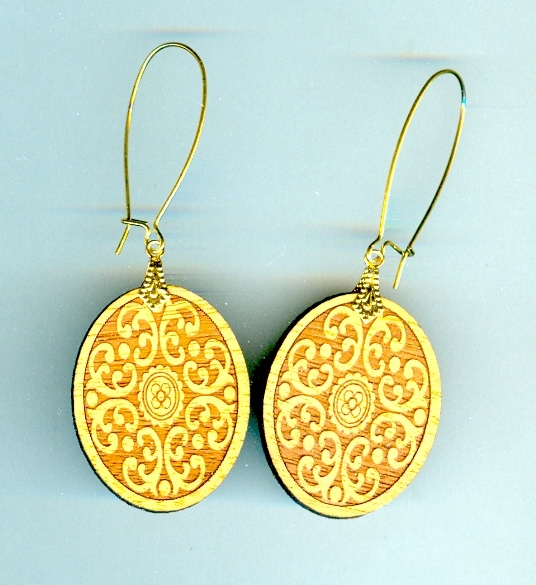 These lovely flat oval wooden earrings are carved in an intricate design reminiscent of Mehndi tattoos. I?m not certain what kind of wood the wooden earrings are made from, but they are VERY lightweight. The wooden earrings dangle from extra-long kidney wires to emphasize their ethnic appeal. 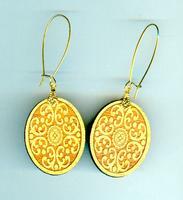 From the top of the earring finding to the bottom of the oval measures about 2-3/4". Unusual, affordable and a wonderful gift; they're another terrific pair of wooden earrings from SPARKLE PLENTY.